जम्बूद्वीप तीर्थ (Jambudweep Tirth) a group of 20 different temples. Hastinapura is the Janma Kalyanak place of three Jain Tirthankars Shri Shantinath Ji, Shri Kunthunath Ji and Shri Arahnath Ji. A Combination of Twenty Unique Temples. The Janma Kalyanak place of three Jain Tirthankars Shri Shantinath Ji, Shri Kunthunath Ji and Shri Arahnath Ji. Daughter "Maina" was born to Smt. Mohini Devi, the wife of Shri Chhote Lal Jain of Tikaitnagar at Barabanki district of U.P. as the first issue at 9.15 P.M. of Ashwin Shukla Poornima (Sharad Poornima) i.e. 22nd October of the year 1934. On account of the spirits of previous birth and the hard struggle of the present, Maina left home in 1952 and in the year 1953, she took Kshullika Deeksha from Acharya Shri Deshbhushan Ji Maharaj. In the year 1956, she became `Gyanmati Mataji` by taking Aryika Deeksha from Acharya Shri Veersagar Ji Maharaj, the first disciple (Pattadhish Acharya) of Charitra Chakravarti Shri Shantisagar Ji Maharaj, the first Acharya of the 20th century. Realizing the importance of her great worldwide activities, vast literary writing, socially- beneficial inspirations etc. Jain Samaj and various Acharyas have honoured her by conferring various titles such as Ganini Pramukh, Charitra Chandrika, Yug Pravartika, Vatsalyamoorti, Vagdevi, Rashtra Gaurav etc. Besides these, Dr. Ram Manohar Lohia Avadh University-Faizabad (U.P.) has dignified itself by presenting the honorary degree of D.Litt. to her in the year 1995. Pujya Mataji has completed the Sanskrit Teeka (explanatory note) of the Sutras of the sixteen books of Shatkhandagam Grantha, the 2000 years ancient Jain Scripture. The structure of Jambudweep, depicting Jain Geography, is the model of our grand universe. Centrally located Sumeru Mountain is considered as the central point of it. Due to the location of Sumeru, Jambudweep structure has four distinct regions in East, West, North and South. The East region is known as East Videh Kshetra and the West region as West Videh Kshetra. In the South direction, with the prominence of Bharat Kshetra, Himvan etc. mountains, Ganga-Sindhu etc. rivers, Haimvat etc. Kshetras, Bhogbhumis (lands of enjoyment) with Kalpa-Vrikshas (wish fulfilling trees), Chaityalayas (Temples), palaces of deities, ponds, gardens etc. 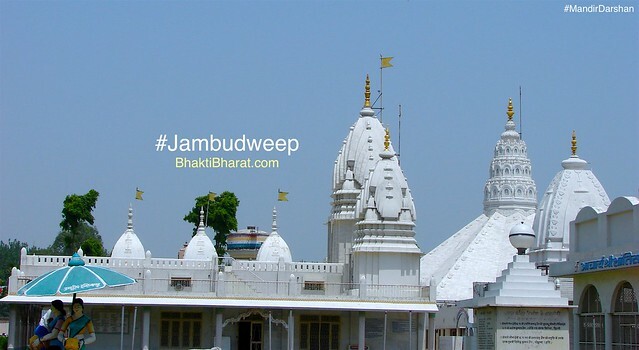 Terahdweep Jinalaya is the prominent centre of attraction of Jambudweep Tirth. 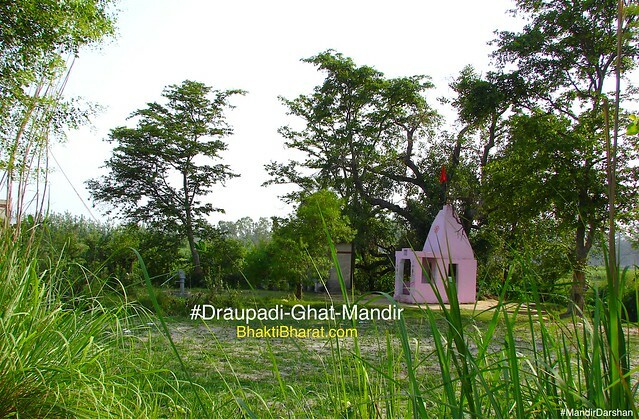 Although it was the long-cherished dream of its inspirator Pujya Ganini Pramukh Shri Gyanmati Mataji, yet it was completed with Panchkalyanak Pratishtha in April-May 2007. It is the marvellous indoor structure of 13 dweeps of Madhyalok with 458 golden Akritrim (Natural) temples, 5 Golden Merus, 170 Samavsarans, various Dev-bhavans, oceans, rivers, mountains, bhogbhumis etc. 2127 Jin-idols have been consecrated in this beautiful Jinalaya, the first of its kind in the world. By bowing down before these Jin-idols, the devotees get their sincere wishes fulfilled essentially. Name of Thirteen Dweeps Jambudweep, Dhatki Khand Dweep, Pushkarvar Dweep, Varunivar Dweep, Ksheervar Dweep, Ghritvar Dweep, Kshaudravar Dweep, Nandishwar Dweep, Arunvar Dweep, Arunabhas Dweep, Kundalvar Dweep, Shankhvar Dweep, Ruchakvar Dweep. Another marvellous structure of Jambudweep campus; consisting of Adholok (7 hells), Madhyalok (with islands and oceans) and Urdhvalok-16 heavens along with graiveyaks, Anudishs, Anuttars and Siddhashila on the top. Electronic lift is ever-ready to take you to Siddhashila in few seconds. Here, the view of Akritrim (Natural) temples, heavenly palaces, deities, hells, hellish-beings etc., are more than enough to fascinate all. Except this, one will renounce the sinful activities by observing the scenes of cruel atrocities on hellish-beings in different hells along with adopting virtuous deeds and spirits observing the gracious-peaceful life of heavens. Digambar Jain Trilok Shodh Sansthan established by the inspiration of Pujya Gyanmati Mataji. The institute bought a small piece of land for Jambudweep. 11.25 feet high standing postured Bhagwan Mahavir later on build a Kamal Mandir. Sumeru Parvat was completed with 137 inner stairs. Akhand Gyan Jyoti established By Defence Minister Shri P.V. Narasimha Rao followed by Jambudweep Gyan Jyoti Rath Yatra. Jambudweep Jinbimb Pratisthapna Mahotsava: Complation of 205 Jin-idols around Sumeru Mountain. 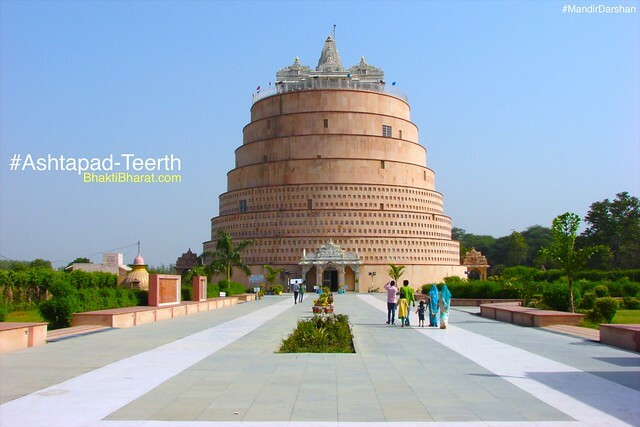 Lotus Temple: 11.25 feet high standing postured Bhagwan Mahavir build as Kamal Mandir. Shri Chandraprabhu Jin Mandir inaugurated on Sharad Poornima By Shri Ajit Singh. 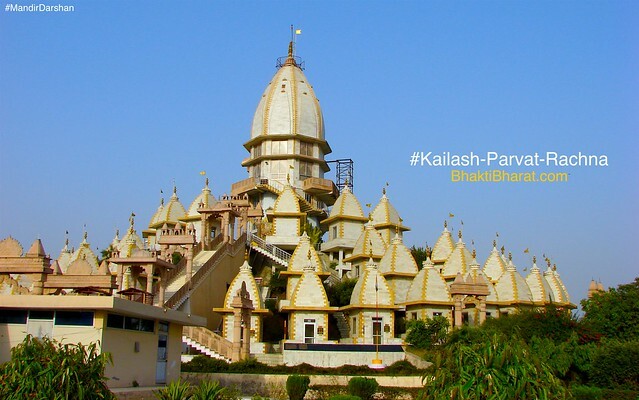 Kailash Parvat dedicated to Shri Rishabhadev Ji, inaugurated by Atal Bihari Vajpayee as Ashtapad Mandir. Aryika Diksha Swarn Jayanti Bhawan constructed in 2007. Terahdweep Jinalaya: Inspirator of Pujya Ganini Pramukh Shri Gyanmati Mataji, it was completed with Panchkalyanak Pratishtha in April-May 2007. Inauguration of Teen Lok Rachna on Sharad Poornima 2010 By Shri Pradeep Kumar Jain.